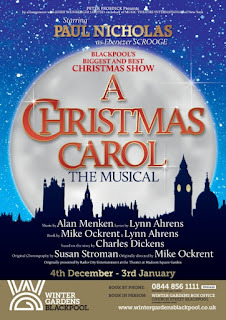 On Wednesday evening we went to see A Christmas Carol - The Musical, at Blackpool Opera House. Ordinarily we wouldn't have been able to go to a show on a Wednesday evening but as it was the Cubs Carol Service on Thursday evening we had swapped nights so it fitted in perfectly for us. 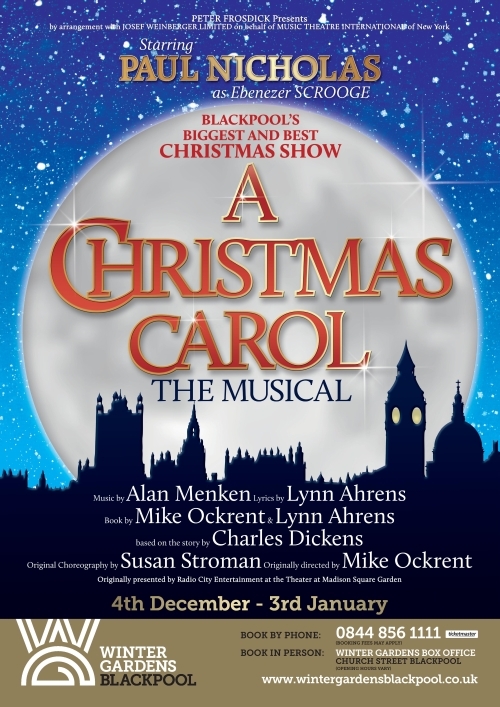 Whilst I knew the gist of the story I have never actually read the book or seen the film so I was really looking forward to seeing the musical, especially when I discovered that it stars Paul Nicholas as Ebenezer Scrooge. Paul was one of my favourite singers when I was a child so I was thrilled to have the opportunity to see him live. The Opera House, one of the UK’s largest Theatres, is located within Blackpool’s famous Winter Gardens and seats almost 3,000 people. It is a lovely theatre and has plenty of original features. We had a good view of the stage from our seats and there was a reasonable amount of leg room. We parked on a nearby car park that was only a few minutes walk away from the theatre and it cost £3 for the evening. The well thought out set made use of the whole stage and was easily transformed from a London street to Scrooge’s house. The set and costumes were impressive and very effective at transporting us back to Dickensian times. The large cast were excellent, Corrine Priest as the ghost of Christmas past and Tom Bright as the ghost of Christmas present really stood out for me, Corrine’s crystal clear voice was amazing to listen to and Tom added plenty of humour to the night. However the star of the show has to be Paul Nicholas who brilliantly portrayed Ebenezer’s transformation from a miserable miser into a much warmer hearted human being. I thought the Ghost of Christmas Future, a huge black puppet that glided around the stage was especially well done, adding a touch of darkness to the tale. The show was very well choreographed with lots of amazing dance routines that fitted perfectly with the songs. My particular favourite was Fezziwig’s Annual Christmas Ball which had a catchy tune and really livened things up. During the first half of the show we felt the sound was not very clear, especially in the numbers with the whole cast singing. This seemed to have been corrected by the second half when the lyrics were much easier to understand. Charles Dickens’s famous story has been very cleverly put to music by Alan Menken and the five piece orchestra, led by Andy Mudd, played constantly through the production giving life to the show. A wonderful wintery finale delighted the audience and was a perfect ending to a Christmas show. The production is at Blackpool until the 3rd January so if you are looking for an alternative to a traditional pantomime then this is well worth seeing.